"Prior to undertaking my placement year with Atkins, I knew that I would like to work within the transport sector of engineering. Throughout the placement I have had the opportunity to work for clients in Oman, Saudi Arabia, Swansea and, mostly Heathrow Airport. I have worked on technical drawing production, undertaken calculations, used technical software, produced written reports and gained an understanding of the project delivery process. Initially I was based in the Ports & Maritime division, which I felt was perfect for me as I have a keen interest in the shipping industry. Within no time at all I was involved in active projects; designing the berth layout for superyacht marina, undertaking a stakeholder analysis and benchmarking exercise as part of the delivery of a masterplan for the port of Khasab in Oman. I was also quickly able to make use of what I learned in the Coastal Engineering module at university, undertaking wave overtopping calculations and specifying the construction of a rock revetment breakwater. 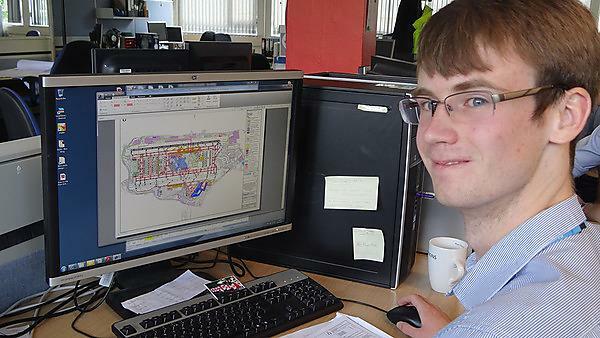 Three months into my placement, I transferred to the Aviation team whereby I worked on projects at Heathrow Airport. I quickly embraced the opportunity to learn about this specialism of engineering - I found it extremely rewarding learning about the airport environment with every task I did. Airports have a plethora of underground services, including electricity, communications, drainage and water supplies and Heathrow was no exception to this. Throughout my placement I became heavily involved in both the provision and protection of pipes, ducts and cables throughout the airport. The need to protect services was particularly critical when specifying pavement reconstruction works. I used AutoCAD software extensively throughout, using it to determine catchment areas, produce technical drawings and undertaking clash detection of services, to name only a few of the uses. As I became adept at dealing with services, I was given the responsibility to produce survey specifications that would be issued to the contractor at Heathrow, identifying which sub-surface services should be surveyed, where cores should be taken through the existing pavement, or where ground-penetrating radar tests should be carried out. I had always known that I wanted to undertake a placement year and I'm extremely grateful that I had the opportunity to do so. Not only have I been able to learn about a sector of engineering that I had never considered before, but I have thoroughly enjoyed it and made some good friends. As if this wasn't incentive enough, I was also paid throughout, allowing me to save enough money to hopefully see me through my final two years at university. One of my biggest tips I would give to anyone starting on a placement is to forget that it is for a definite length of time and think of yourself as a permanent member of staff, as that is what you are, albeit only for a year! The team were extremely approachable and encouraged me to record the work that I was doing, in the form of development reports and as development objective achievements. By allowing me to complete work that count towards these objectives, I have made a great start on the journey towards becoming chartered as a Civil Engineer."